The weekend saw our annual 2 day game at a local show. As I've mentioned once or twice before (! ), this year's effort featured the SYW using our own rules. Out of the nine years we've been doing this, the recent demo game was IMO our finest hour. 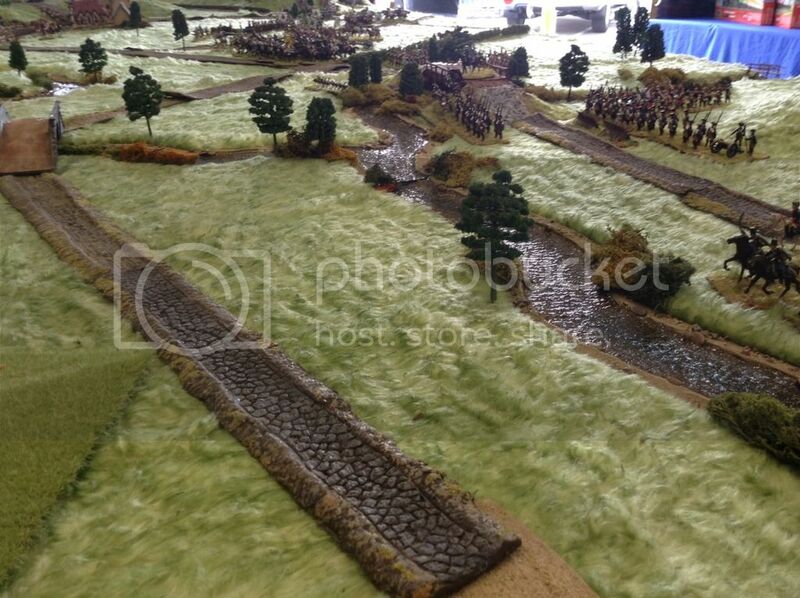 The table featured a scratch built star fort, excellent terrain, about 1300 figures (HaT & others) and an enthralling and historically plausible game. I am pleased to report "A Glorious War" handled its first really large game quite seamlessly. The pace was fast & indeed, if we hadn't stopped to continually chat to the interested audience, it could have easily been wrapped up in a day. And I am thrilled at the success of period tactics. 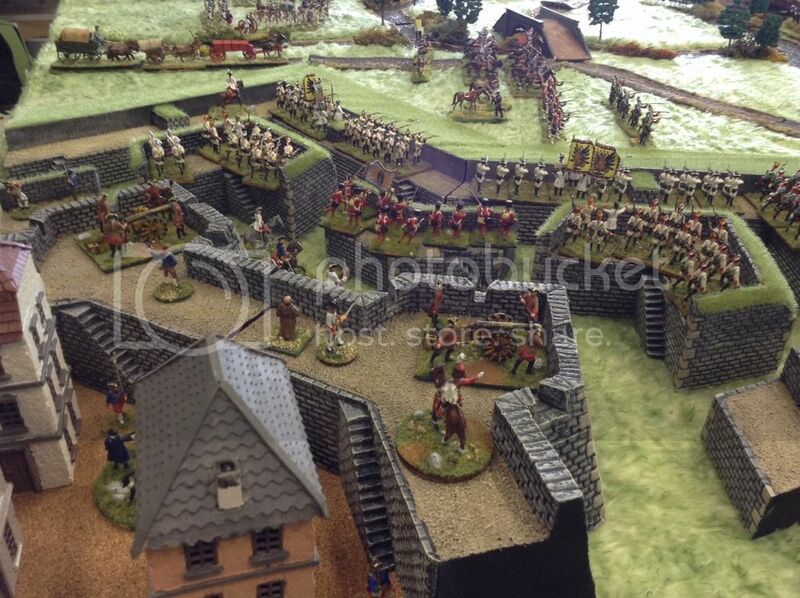 On a lower level, Passage of Lines, Supported cavalry lines, limited skirmisher ability etc all worked. And at a larger level, so did period tactics. The French, somewhat slower in manoeuvre & with slightly more fragile units & qualitatively inferior command, had to defend their line, including the key town of Hamelin. The Prussians, led by Frederick himself, launched a classic example of the oblique order which pinned down much of the French army and overwhelmed the left flank defenders & took the town, thus gaining the victory. As French commander, I marvel at the inexorable nature of the Prussian attack & even as a loser, I am glad I was a participant. 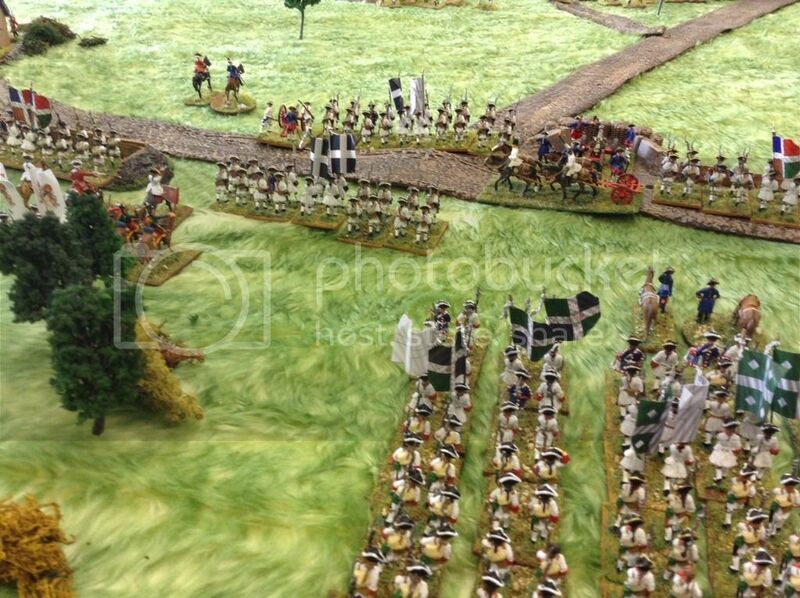 You can see the French commander, Prince Soubise, in red with entourage on the left. Show us more pictures from the game and the figures! Please!